What does teaching look like at its very best? How are great teachers able to ignite a love of learning and change students’ lives? In this book you’ll learn from seven remarkable teachers who stretch beyond the conventional foundations of good teaching to transform their classrooms into exciting, dynamic places where teachers and students cocreate the learning experience. 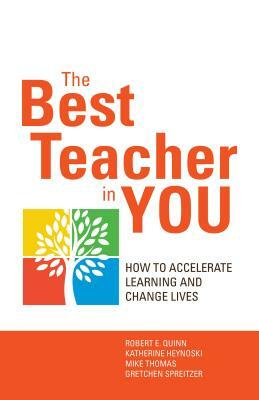 Based on six years of extensive work, the book outlines a framework that identifies four dimensions of effective teaching and learning that are integrated in these highly effective teachers’ classrooms—and that all teachers can use to recognize and release the potential in themselves and their students. Robert E. Quinn is the Margaret Elliott Tracy Collegiate Professor at the University of Michigan. Katherine Heynoski is senior specialist, powerful practices. Gretchen M. Spreitzer is the Keith E. and Valerie J. Alessi Professor of Business Administration at the Ross School of Business, University of Michigan. Quinn is cofounder, and he and Spreitzer are codirectors, of Ross’s Center for Positive Organizations. “Can highly effective teachers help their peers ‘set classrooms on fire’? The Best Teacher in You not only says yes but also tells us how. Teachers, parents, and public-policy makers should take this insightful and inspiring study to heart.